In an earlier article, we outlined some general aspects of plan reviews and the benefits gained relative to costs (article link). Here, we focus on plan reviews related specifically to the building enclosure, including roof, wall, foundation, and floor assemblies. As with all plan reviews, the purpose is focused squarely on minimizing errors and omissions. 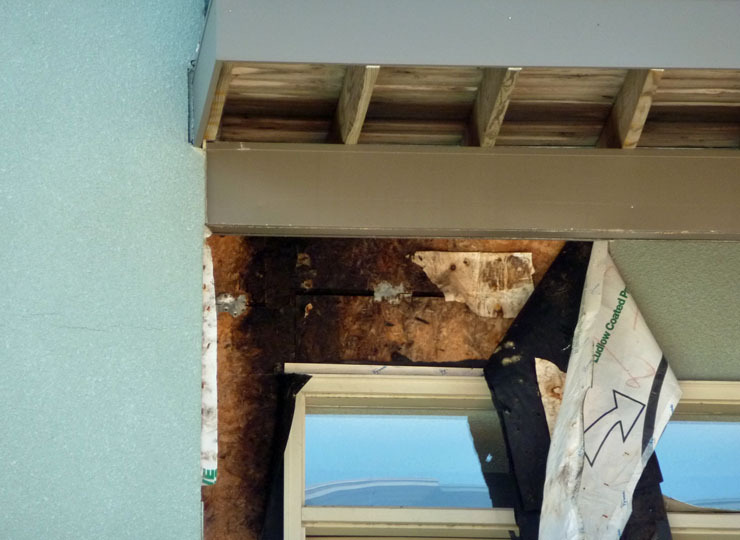 However, building enclosure reviews also provide important instruments in improving moisture management and achieving a more resilient building enclosure. Poor moisture management design and detailing can result in a compromised project whose systems or assemblies fail to perform. They are prone to premature failure and their component service lives will be significantly reduced or will demand higher levels of maintenance during their life cycle. The plans and specifications are critically reviewed with respect to the following four aspects of moisture management. Limiting the Moisture Load: Above and below grade building assemblies are adversely affected by high water burdens. The plan review will identify where site storm water run-off lacks proper drainage or diversion. Building orientation and exposure are examined to assess risks from prevailing wind-driven rain or solar radiation. The review also identifies potential risks from roofs, projecting assemblies, material transitions, terminations, wall penetrations, or control joints. Vulnerabilities in these systems are exploited and damages are exacerbated. What control and diversion measures are in place and are they adequate? Is protection, sheltering, or an alternate orientation needed? Industry standards tell that incidental water intrusion can be expected. The greater the water burdens on the assembly’s exterior, the greater potential for intrusion. Materials and Assembly Design: The plan review critically evaluates the performance of building enclosure assemblies. Multiple design choices are made when creating wall and roof assemblies. These include rainscreens, vapor retarders, types of thermal insulation, air and moisture barriers, interior and exterior finishes. Properties of selected materials such as permeability, absorbtivity, diffusablity, and drying are scrutinized for their compatibility in the assembly. For example, based on the assembly’s components, is a rainscreen required? Is a vapor retarder needed or will it be problematic? The ability for the assembly to store or dissipate incidental moisture is examined. The building enclosure exists in a variable environment. It should accommodate reasonable extremes of exterior and interior environments. Hygrothermal modeling is an excellent tool to verify these tendencies and should be employed in the review when necessary. Moisture Management Details: The review verifies the efficacy of preventing water intrusion, diversion or dissipation of incidental intrusion, and restricting moisture exfiltration from the interior. The plans and specifications indicate the details of moisture management. The review will carefully trace the continuity of air, moisture, and thermal barriers. Provisions and efficacy of flashings and diversion are evaluated. Detailing of component interfaces is always critical. Interfaces at penetrations, terminations, material transitions, and assembly transitions are examined. Do the plans and specifications reflect the material or product manufacturer’s installation recommendations? Do they reflect the recommendations of the respective trade associations? Do they also reflect minimum industry standards such as those promoted by ASTM E241, E2266 and ASHRAE 160. Are the quality standards referenced in the specifications up to date and relevant? A critical eye is also focused on what is not indicated or specified in the documents. That is to say, can that which is not detailed be reasonably and correctly inferred from the rest of the documents? Different material or assembly transitions often lack the necessary resolution. This gap will likely not be filled by other project requirements such as the manufacturer’s installation instructions. Code Compliance: Minimum heat and moisture transfer requirements for building enclosure assemblies are often under the authority of the prevailing energy code. The plan review verifies compliance on these issues. However, these are just that, minimum requirements. More robust standards are often required for resilient enclosures. While promoting higher building performance, designers may find themselves at odds with specific code requirements. In this case, the code provides for alternate materials, design, and methods of construction. Alternate systems are acceptable provided that the code intent has been met. The burden of proof and documentation is on the designer. The plan review should verify that the code intent has been met. Plan reviews should evaluate assemblies from a holistic perspective. Successful projects reflect building solutions that are effectively integrated. Successful moisture management begins in design. And, as it is said, the devil is in the details.